There are two types of chow mein the steamed and the crispy variant (also be called Hong Kong style chow mein). These noodles might share the same name but they are totally two different noodle types, crispy chow mein uses flat noodles which are deep fried while the soft chow mein uses long rounded noodles that are steamed. I had posted a chow mein recipe before but in this post we will be using the crispy variant which gives Asian noodle dishes a new dimension which is texture, a whole lot of it. So what goes well with these noodles? Some crunchy broccoli and carrots, some tender chicken and mushrooms and thick gravy just mentioning those make me drool already. In a bowl mix together chicken, 1 tbsp cornstarch, salt and sesame oil. In a wok add peanut oil and bring heat to high. Once oil nearly reaches its smoking point add chicken and stir fry for 1 minute, remove from wok then set aside. Using the same wok, sauté garlic and ginger. Add mushrooms then stir fry for 1 minute. Add onions, carrots, yellow capsicum and broccoli, stir fry for 1 minute. Dissolve 1 tbsp cornstarch in chicken stock then pour into the wok. Add chicken and bring it to a rapid boil, simmer for 1 minute then add the crispy noodles. Give it a good mix to evenly coat noodles with sauce. Remove from wok then serve. Thanks, now I’m drooling too. Oh wow! My favorite. I love chow mein. Will copy this. Maybe I’ll add few shrimps and squid. So mouth watering! Looks wonderful and great for a weeknight. I think I’d be happy eating it any night. I buy crispy noodles very rarely and usually prefer the transparent ones, but they look perfect here! I love those noodles! This looks like a great dish! You know I am a stir fry nut lol, but this Mixed Veggies and Cripsy Noodles looks amazing. I love it.. I love this dish. This dish looks delicious. Especially those noodles! Love that they’re crunchy. Looks clean and delicious. Sorta wish I had a plate in front of me now! I m drooling…what a colorful looking dish…crispy noodles is one of my fav things! Oh this looks really delicious!! 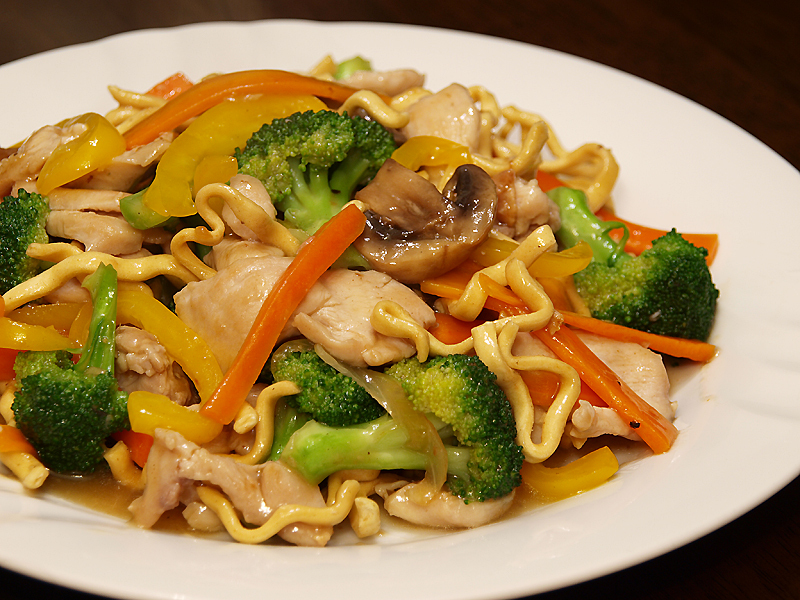 Crispy noodles sound great – your dish looks so healthy and flavourful. Very healthy and the more veg inside, the more we enjoy at home. Very informational…I didnt know the difference between the two noodles..the recipe looks brilliant – beautiful space and I have bookmarked this to make it sometime soon. Thanks for the kind words as well as for supporting my blog!